Labneh – a word we frequently see on a menu these days. For those who have not yet come across is simply strained yoghurt, so it becomes thicker, almost like the consistency of cream cheese yet preserving yoghurts sour taste. It is super simple to make – line a sieve that it comfortably sat over a bowl with a cheese or muslin cloth then stir a little salt and a squeeze of lemon into Greek yoghurt and pour the mixture into the cloth. Tie the cloth together and leave to strain for up to 24 hours. We have often made this in a rush and have sped up the process by squeezing the tied ends together to push the liquid (the whey) out, you will end with a softer labneh than if you had left it for 24 hours but that is perfectly acceptable for this recipe. We often serve labneh as part of a mezze platter, spooned into a pretty bowl with a scattering of Za’tar and drizzled with good quality olive oil. Perfect for dipping crunchy vegetables or some warm pita breads. In this recipe we like to dollop it over a serving platter and spread the warm roasted carrots over the top finishing with the sweet roasted garlic dressing. It is a wonderful side dish to either lamb or chicken or as part of a lunch spread. We have been very excited about digging up our carrots this year which we carefully planted earlier in spring because we didn’t just plant seeds for the ordinary orange carrot – but seeds for multi coloured carrots. And hey presto when we pulled them out of the soft soil there were orange, yellow, white and purple carrots! Amazing how something so simple can bring such joy. Such fun to add the colour to a dish – even if you are simply roasting them to serve alongside your Sunday roast. You can pick coloured carrots up at specialised green grocers (our local, Parkway Greens in Camden stocks them) or you can find them at Farmers markets. This dish would not suffer in the slightest if you were to use your everyday carrot, just if you come across the coloured variety why not. What we would suggest is buying young carrots, as more delicate and attractive in the dish. For anyone interested we bought Unwins carrot rainbow mix seeds and they worked well. 1. Place a cheese cloth in a sieve that is balanced over a bowl and pour in the yoghurt and stir in the salt. Tie up the cheese cloth tight and leave for 1 – 24 hours, the longer you leave it the thicker it will be. 2. Pre heat the oven to 200c. place the carrots, garlic, thyme, olive oil, maple syrup, dried chili, za’tar and salt and pepper in a roasting tin and toss. Place in the oven for 20 – 30 minutes till nicely golden and sticky. 3. Remove the garlic from the tray and squeeze out into a little bowl (careful not to burn yourself) add a glup of olive oil, the lemon juice and maple syrup and whisk into a dressing, season. 4. 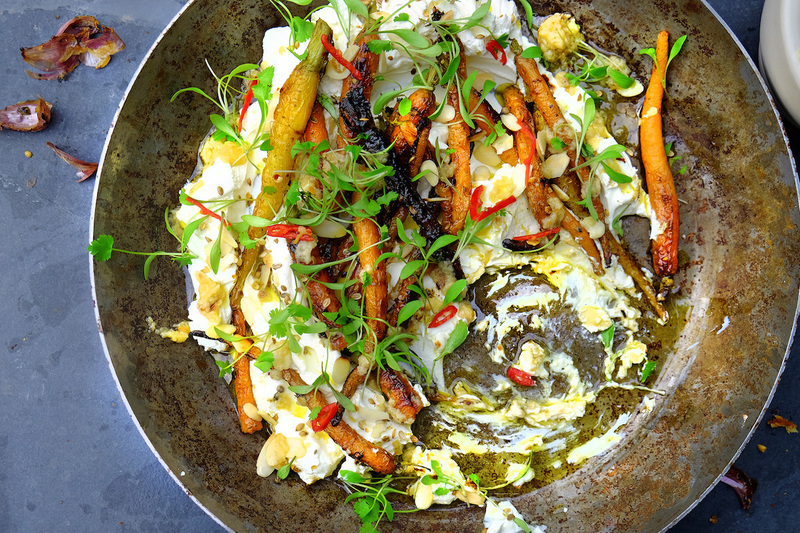 Spoon the labneh over a dish, lay the carrots over and pour over the dressing, finish with sprinkling over coriander leaves and sliced chilli.